What would God say about those who blatantly misrepresent His Holy Spirit; who exchange true worship for chaotic fits of mindless ecstasy; who replace the biblical gospel with vain illusions of health and wealth; who claim to prophesy in His name yet speak errors; and who sell false hope to desperate people for millions of dollars? The charismatic movement has always been a breeding-ground for scandal, greed, bad doctrine, and all kinds of spiritual chicanery. As a movement, it is clearly headed the wrong direction. And it is growing at an unprecedented rate. From the Word of Faith to the New Apostolic Reformation, the Charismatic movement is being consumed by the empty promises of the prosperity gospel. Too many charismatic celebrities promote a “Christianity” without Christ, a Holy Spirit without holiness. And their teaching is having a disastrous influence on a grand scale, as large television networks broadcast their heresies to every part of the world. 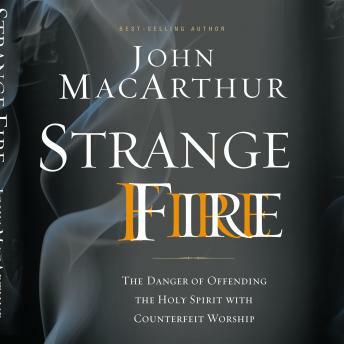 In Strange Fire, bestselling author and pastor John MacArthur chronicles the unsavory history behind the modern Charismatic movement. He lays out a chilling case for rejecting its false prophets, speaking out against their errors, showing true reverence to the Holy Spirit, and above all clinging to the Bible as the inerrant, authoritative Word of God and the one true standard by which all truth claims must be tested.